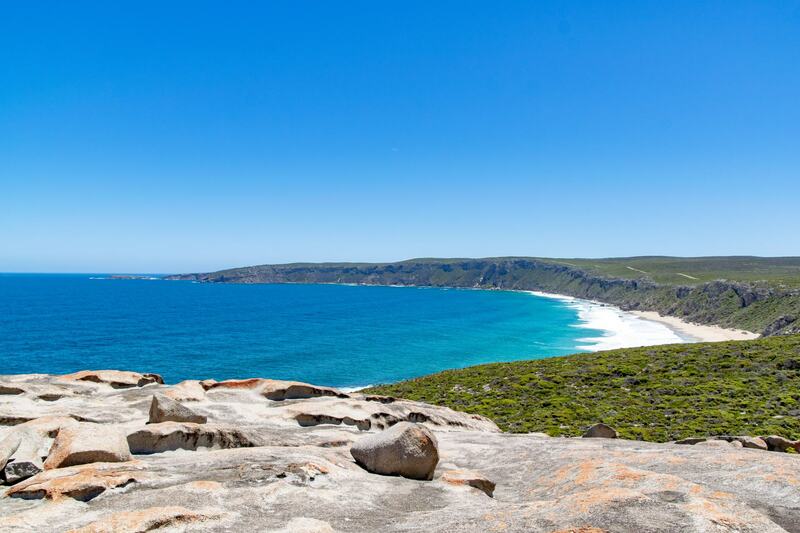 At the very end of Kangaroo Island you can find Flinders Chase National Park, a stunning national park with so many sites carved out by the natural elements you won’t know where to start! 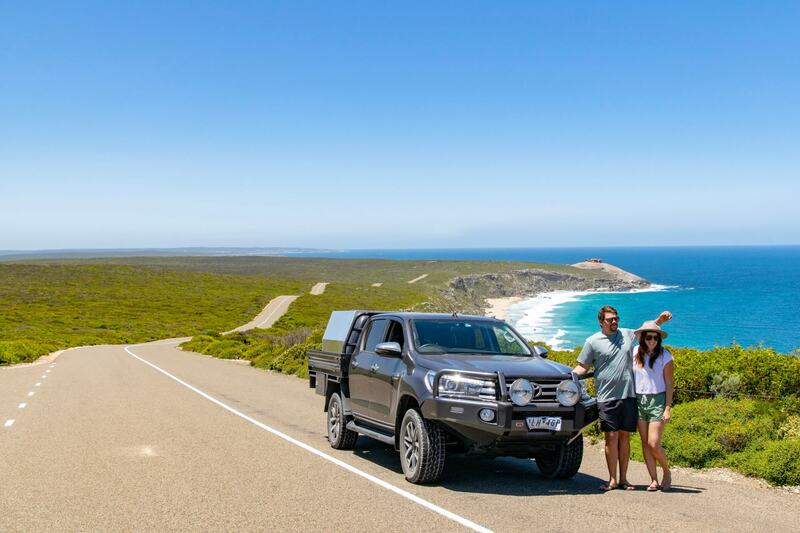 No visit to Kangaroo Island would be complete without a drive through Flinders Chase, it’s absolutely overflowing with amazing landscapes and attractions, from the Remarkable Rocks and Admirals Arch, to countless walking trails, lighthouses and lookout points to keep you busy all day long. 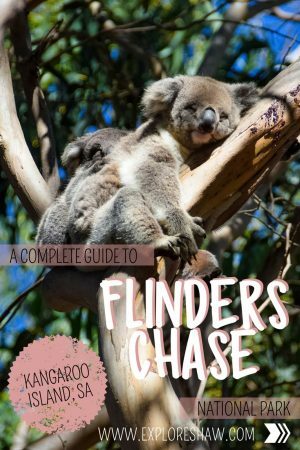 If you’re visiting Flinders Chase National Park here is a quick guide with everything you need to know! Flinders Chase National Park is located right at the Southern end of the island, 110km away from the main town of Kingscote. There are signs pointing towards Flinders Chase all the way around the island, so it’s easy to figure out how to get there. 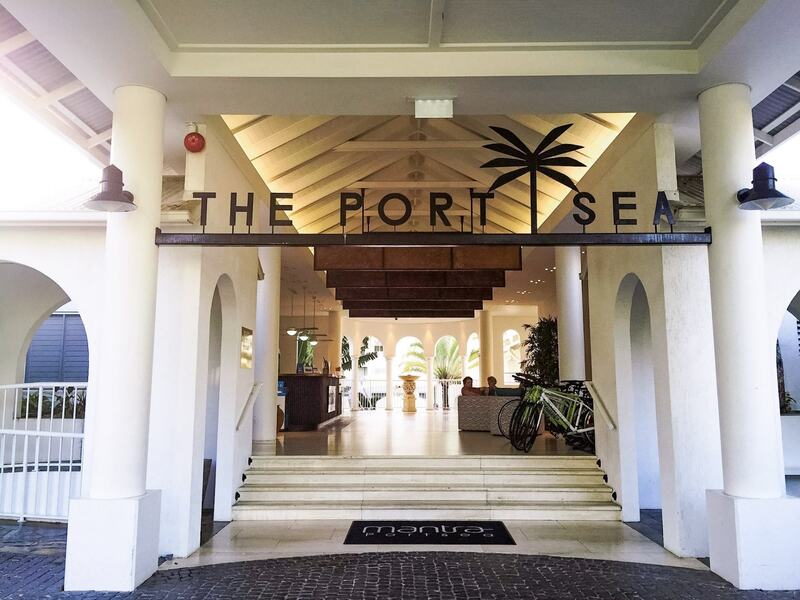 Follow either the Playford and West End Highway or South Coast Road right around the island and you won’t miss it. 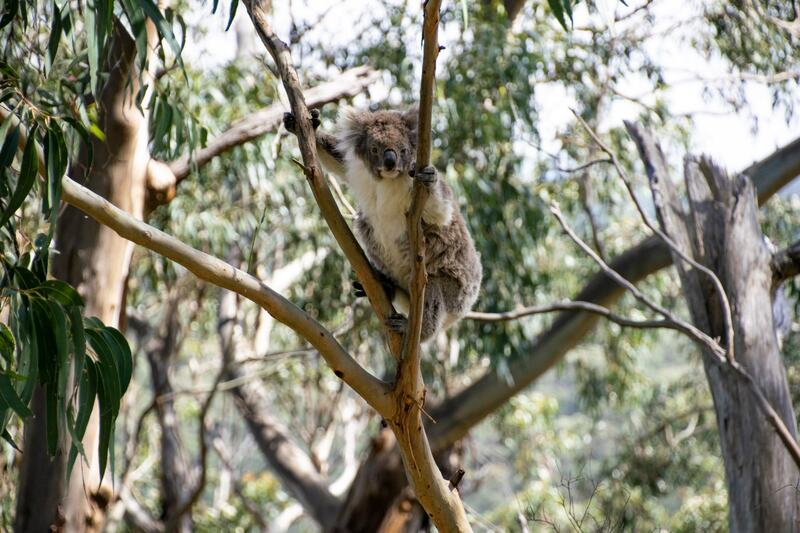 Check out the cheapest car rental deals for Kangaroo Island. 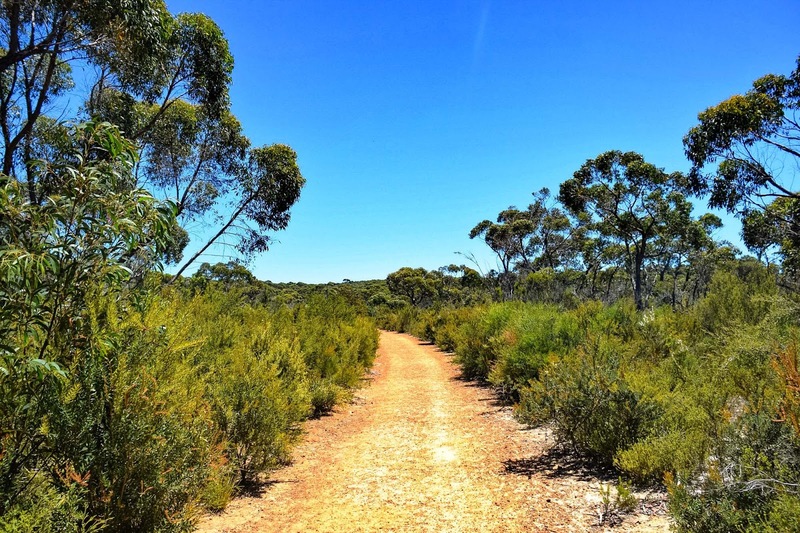 When is the best time to go to Flinders Chase National Park? 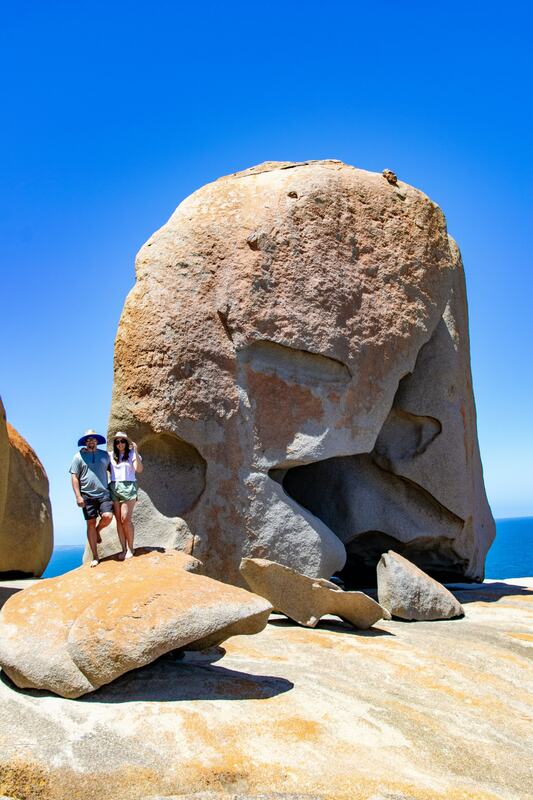 There’s not really a bad time to visit Kangaroo Island, with visitors flocking into Flinders Chase National Park all year round. 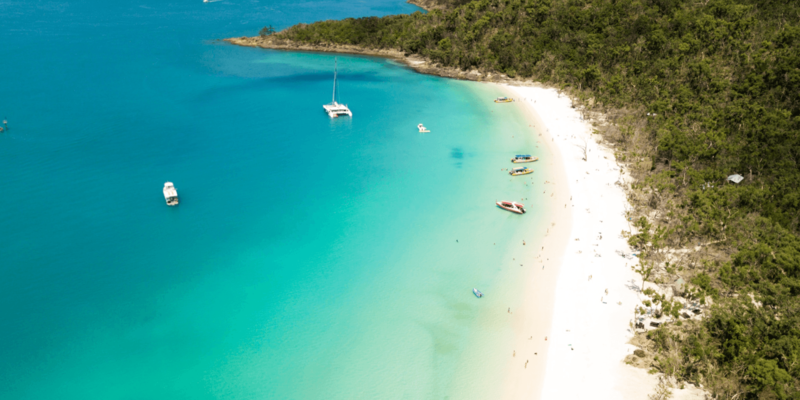 The summer months between December and February, particularly January during the Australian school holidays is definitely the most popular time to visit. The shoulder seasons through spring and autumn are also lovely times to visit, with the slightly cooler weather allowing hiking and exploring to be a little more comfortable. 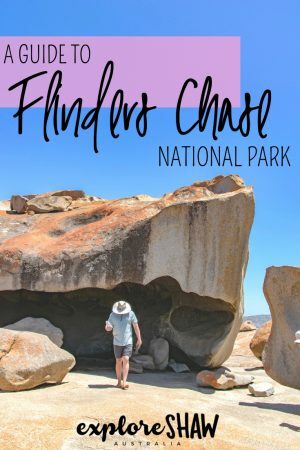 To visit Flinders Chase National Park you will need to purchase an day entry pass. You can pre-purchase them online here or just grab one at the Visitors Centre when you arrive at the park. Entry costs $11 per adult. If you are planning to drive around the park, that’s no problem – your car is included in your ticket price. You will just need to let them know in the Visitors Centre so that they can give you your car permit. If you’re already pre-purchased your tickets online you will also need to stop at the Visitors Centre to collect your car entry permit. If you plan on staying a little longer there’s a discount on your second day, with a two day entry pass being $16. Additional fees will apply if you’re planning to camp in the park and they have to be organized and booked in advance. Please check out the Flinders Chase website for more information on camping in the park. 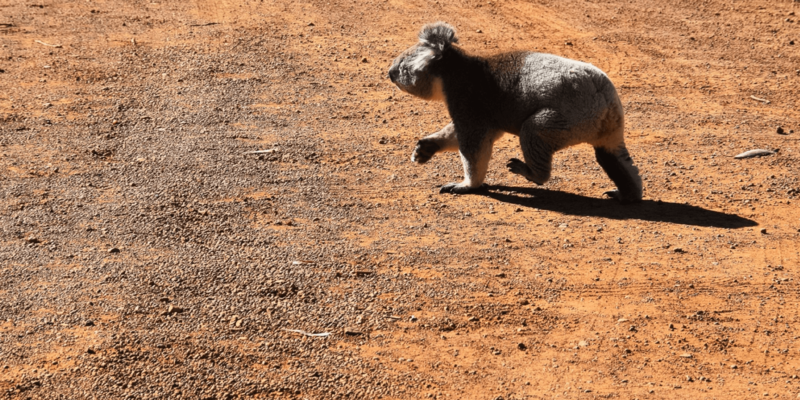 Check out the best places to stay on Kangaroo Island. Without a doubt, these rocks truly are remarkable. 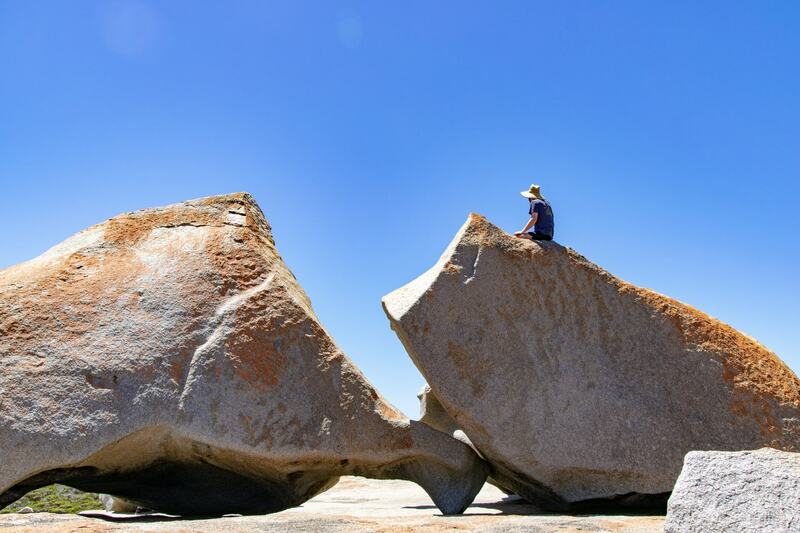 Sitting on the edge of the island, on a flat granite boulder that appears out of nowhere amongst the bush of the national park, the Remarkable Rocks are the result of over 500 million years of wind, rain and pounding waves. They have formed into some really unique shapes, looking as if they have just fallen from the sky and arranged themselves that way. Many of the rocks are covered by a golden orange lichen and signs around the rocks describe even more details about the formation of the rocks. 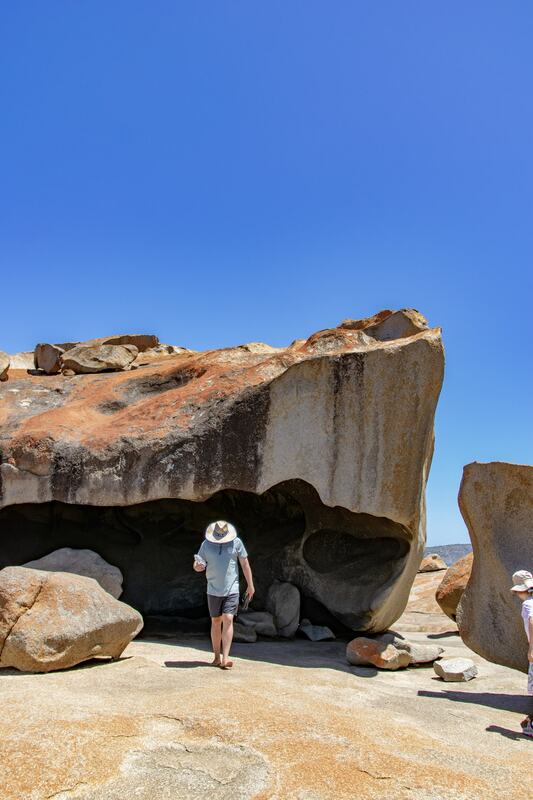 The flat rocks around the boulders are easy and safe to walk on during dry weather, but take extra precaution if it gets windy or wet, as the close location to the cliff face and water can make it quite a dangerous site. 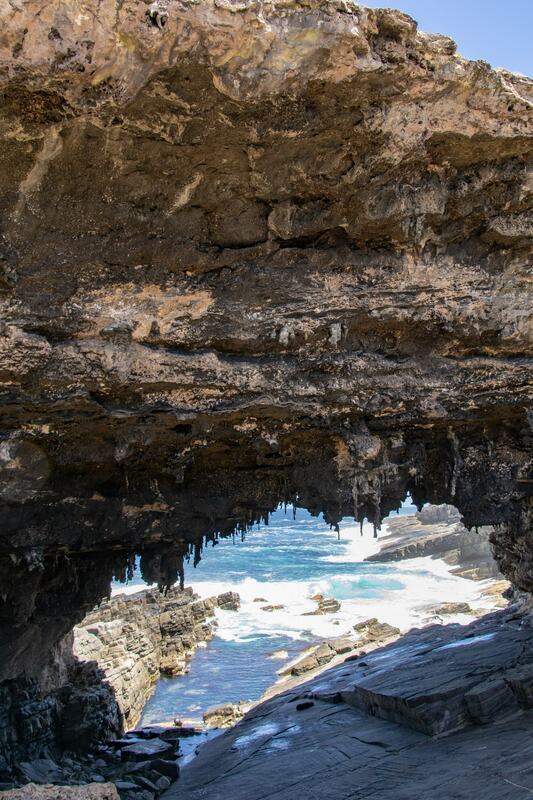 Thousands of years of erosion has created this unique rock bridge called the Admirals Arch, located near the Cape du Couedic Lighthouse. 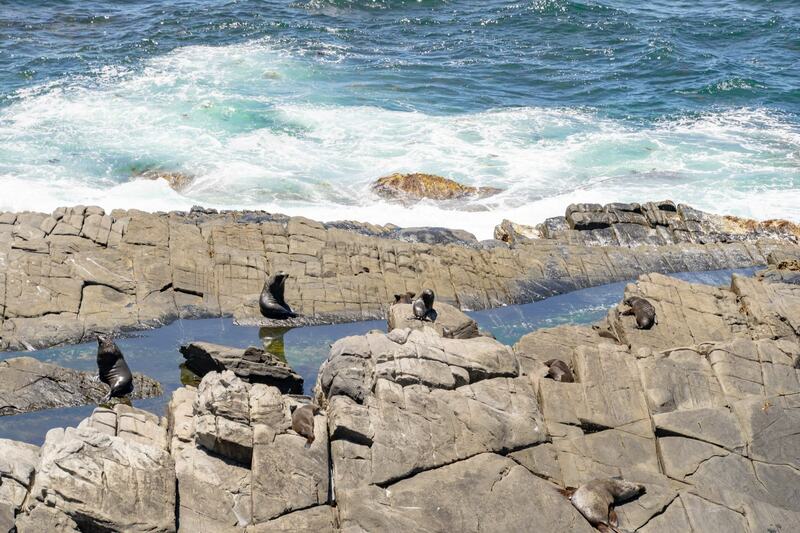 With a long winding boardwalk and viewing platform, the Arch is the best place to observe the New Zealand fur seal colony that have set up home at the landmark. Be prepared for quite a strong smell as you descend to the viewing platforms around the arch, as there are so many seals sitting on the rocks and flat plains that surround the archway and the smell is not a great one. 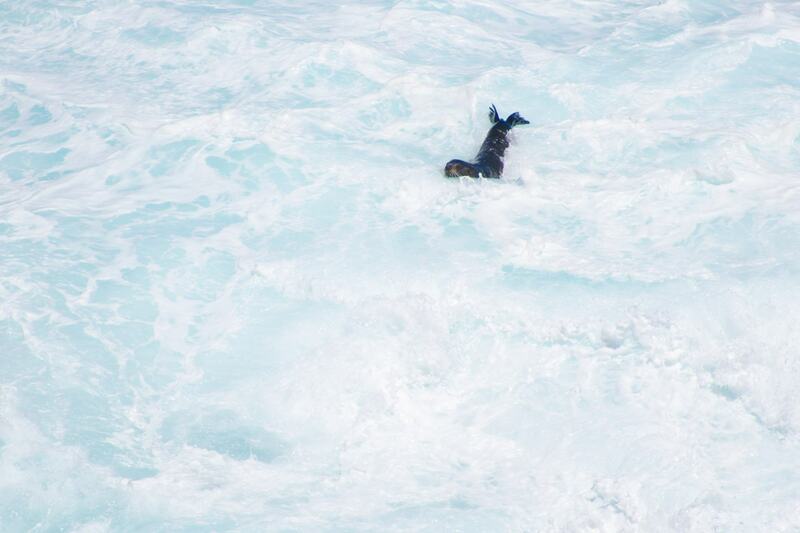 But nevertheless, it’s amazing to see the seals surfing into the rocks with the waves, sunbathing on the rocks and playing around together. 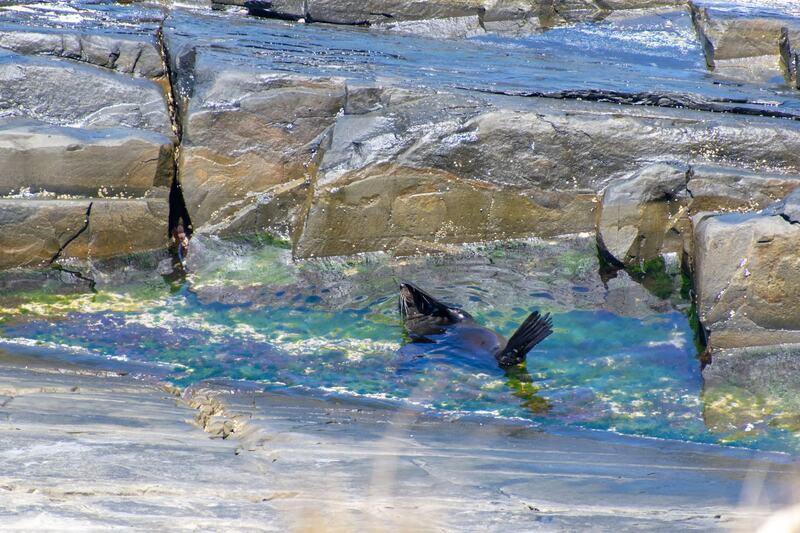 Summer is the primary breeding season for the fur seals, with the rock pools underneath the Arch being a great place to see seal pups playing. Dolphins can also be spotted throughout the whole year. The Platypus Waterhole Walk is one of the easy graded walks in the park, that takes you around some of the parks waterholes and wetland areas. Enticed by the name of the walk, we were definitely hoping to see a platypus on our walk, but you need extreme patience for that I think! Platypus are rare in South Australia, although there are meant to be some in the waterholes along this walk. Dawn and dusk are meant to be the best time to see them, if you can sit and wait patiently enough. The complete walk is a 4.7km circuit that takes about 2 hours to complete. It’s relatively easy, on flat ground. If you don’t spot a platypus on your walk, all might not be lost – it’s also a great walk to spot kangaroos, wallabies, geese, echidnas and goannas. Much of the walk is unshaded, and it can be extremely hot during the summer months. Remember to take enough water with you, as well as plenty of sun protection – sunscreen, a hat and sunglasses are essential. 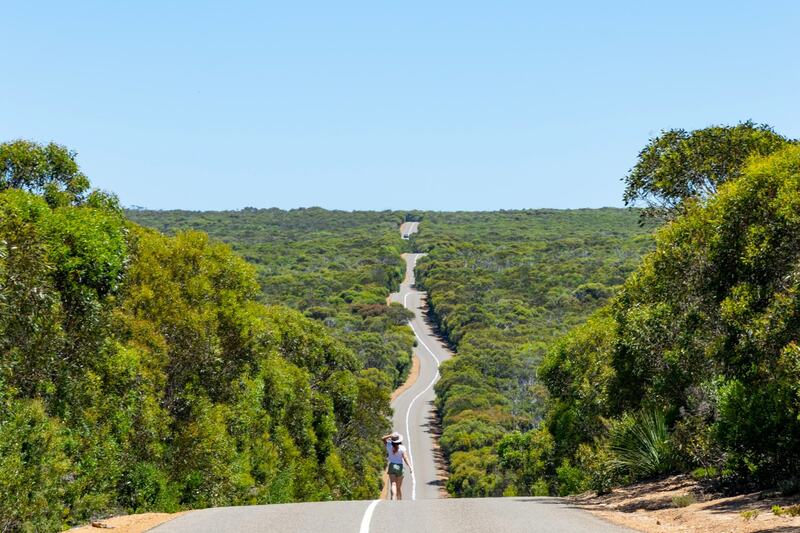 If you’re up for it, the epic Kangaroo Island Wilderness Trail is a 61km, 5 day trek, and is one of Australia’s great walks. Starting at either the Kelly Hill Caves or the Flinders Chase Visitors Centre, this trail winds through some of the most botanically unique areas in all of South Australia, before reaching the rugged coastline of the Southern Ocean and some of the highlights of the national park. It looks absolutely hetic, taking you to places that very few other people have ventured before. Find out everything about this walk at the KI Wilderness Trail website. 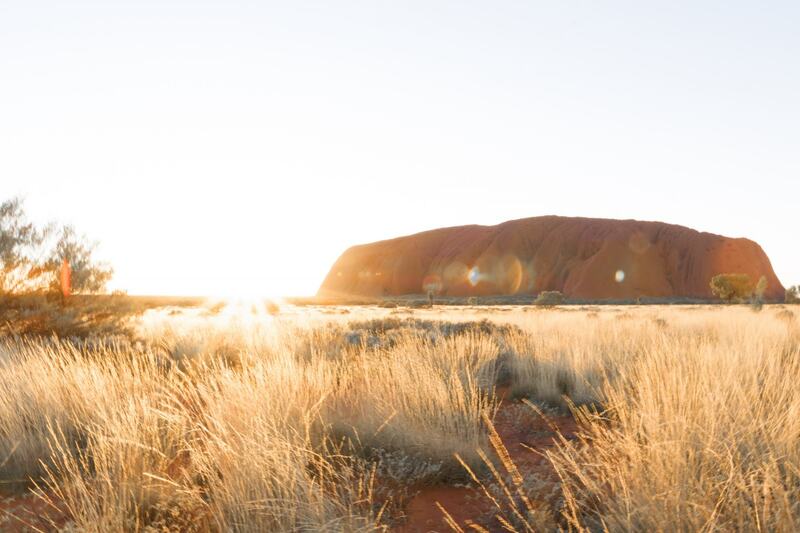 Flinders Chase National Park is open seven days a week from sunrise to sunset. The park will be closed however, on days of catastrophic fire danger and may also be closed on extreme fire danger days. 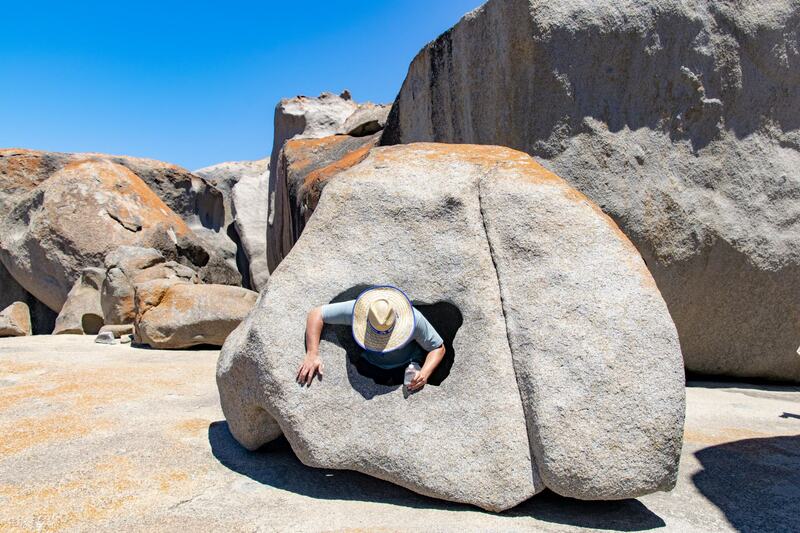 If you’re visiting Kangaroo Island during a heat wave or extreme weather, it’s a good idea to double check that the park is open before making the trip down there. The Flinders Chase Visitors Centre is open from 9am to 5pm each day, where you can buy your permits, gifts and souvenirs and snacks for the day. Or you can find out more on their website here. 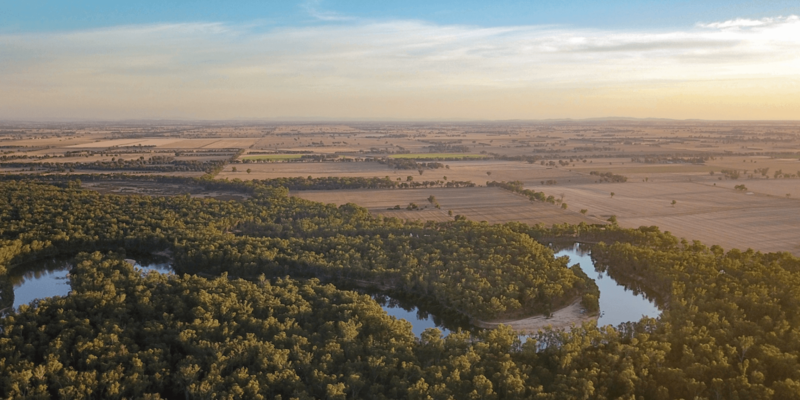 The most important thing to remember about Flinders Chase National Park is the sheer size of the park. You need to give yourself at least a few hours to explore the park, as it takes half an hour just to drive from one side to the other. 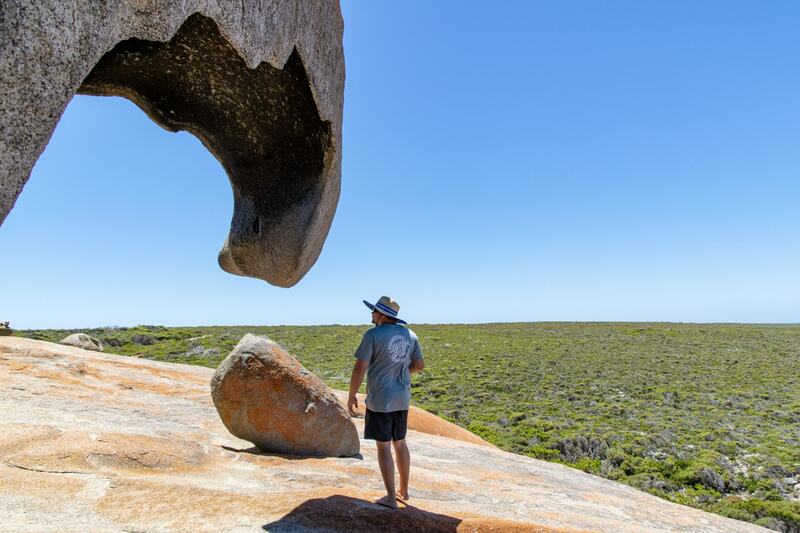 Flinders Chase National Park is a beautiful place to explore, and definitely one of the top highlights for any visit to Kangaroo Island.